(NEW ALBANY, Ind. )—A girl fashions a waste stream sorter from paper towel tubes. A boy makes a car from plastic bottles and yogurt containers. In another room, two middle-schoolers devise a board game that tests the player’s knowledge of World War Two. In yet another group effort, a roller coaster design emerges, based on trivia about the United Arab Emirates – who knew that the UAE is simultaneously the world’s leader in the production of incense and home to the world’s longest sofa? The wildly imaginative ideas, conceived and executed on the fly, were just a few of those that emerged at the Project Ahead Relaunch Summit, held over two half-days last week at IU Southeast. Project Ahead is a national program to support gifted and talented (GT) children, grades K-12. 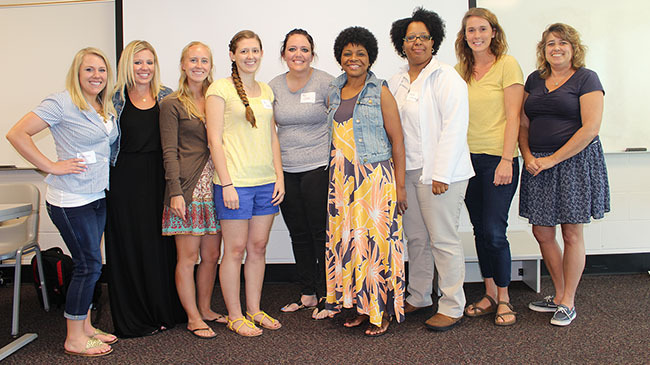 After a hiatus at IU Southeast, it has been relaunched this summer as a laboratory for graduate students in education, focused on middle-schoolers who have been identified as gifted and/or talented by their teachers. At Project Ahead, the middle schoolers took part in a series of activities designed by the graduate students, all of whom are teachers in Kentucky or Indiana, enrolled in the gifted and talented education license program. The project was structured to address both the abilities and challenges of GT students: despite frequently excelling in one scholastic area, GT students often experience deficits in other areas of their academic lives, and sometimes in the social sphere as well. Their area of exception can become a place of comfortable isolation, preventing them from developing the integrative skills necessary to truly bring their talents to bear in the world. One group was encouraged to create something of social use out of refuse – cleaned reusable products such as plastic soda bottles, boxes, yogurt containers, and the like. The project was designed by Karla French and Arlene Lawson, who teach in the Jefferson County Public School (JCPS) system in Louisville, Ky.
Aidan Singleton explains a work of art to the assembled teachers and students. In another room, students came together in a group effort to design board games that could be used to solve academic problems. Since the problem related to state core curriculum standards, the game could then be donated to a local school. The project was designed by Natalie Broderick and Emily Whearty, both elementary school teachers in JCPS, as a creative way to encourage students to review scholastic skills over the summer vacation. The third group contributed ideas for roller coasters to an imaginary theme park. Along the way, they explored the physics of roller coasters, researched different themes and brought them to bear in the designs (think incense and sofas), budgeted for the construction project and learned a bit about how to work in a team. At the end of the two days, the students presented their work to the assembled peers and teachers, both singly and in their groups. It was a stirring display of ingenuity and confidence. For some, the marketing came easy. For others, this was the first taste of presenting a creative idea or piece of work to a supportive audience, and there were jitters to be overcome. “This opportunity shows them that it’s pretty cool to be smart and creative,” said Kirstin Kemppainen, who teaches math and science to fifth and sixth graders at Hazelwood Middle School in New Albany, Ind. Project Ahead graduate students, l to r: Katlin Orr, Mindy Erxleben, Natalie Broderick, Emily Whearty, Jessie Cook, Karla French, Arlene Lawson, Kirstin Kemppainen, with Gwen Shultz (director). As a living laboratory, Project Ahead also benefits the graduate students. Mindy Erxleben has taught fifth grade English language arts and social studies for five years at Nathaniel Scribner Middle School in New Albany, Ind. and is now beginning a new position as a reading specialist at a different institution. She believes that gifted and talented students often become bored, and that one of the biggest challenges for any teacher is keeping them engaged. “The value of this event is learning how to differentiate instruction for gifted and talented students, so that you’re reaching them at their learning ability and stretching their ability for the classroom,” she said. Shultz agrees, and adds that the project presents teachers with a variety of challenges they might not be accustomed to, such as the fact that students who are gifted in one area may also display learning differences or disabilities that affect their performance in other areas, or may also exhibit behavioral issues that prevent them from socializing. From board games about the Second World War and intricately appointed homes for squirrels to Chinese roller coasters and tsunami-themed attractions, the project presentations amazed and amused students and teachers alike. These weren’t semester-long efforts but complex works conceived and executed within a few hours, without the pressure of parameters, a tribute to the design of the challenges and the ability of teachers to know when to stand back and let high ability simply happen. Not everything went according to plan, but even dead-ends were applauded for the insights they provided into intention, conception, execution . . . and duct tape. 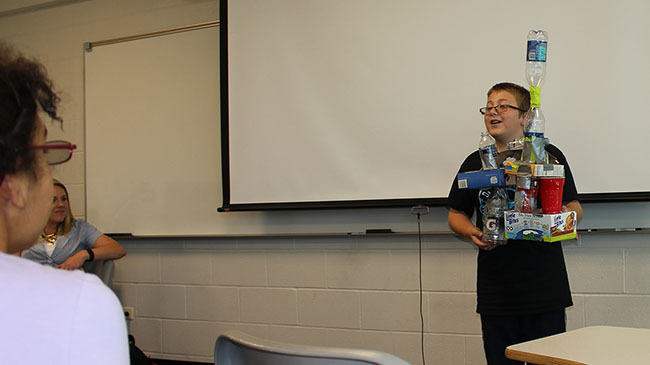 Homepage photo: Tucker Payne constructs an invention from recycled materials during Project Ahead.